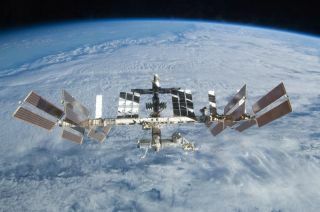 The space shuttle Endeavour is closing in on theInternational Space Station carrying six astronauts andNASA's last big additions for the orbiting laboratory more than 200 miles above Earth. Endeavour is due to dock at the spacestation just after midnight Wednesday morning to deliver the station?snewest room, called Tranquility, and a seven-window dome designed to giveastronauts stunning views of the Earth from space. ?It?s a beautiful day up here on Endeavour,? shuttlecommander George Zamka told Mission Control after his crew awoke at 5:14 p.m.EST (2114 GMT). Mission Control played the song ?Katmandu? by Bob Seger forZamka at the request of his family. Zamka and his crew are due to dock at the space stationat 12:06 a.m. EST (0506 GMT). They are on an overnight shift that requires themto work at night and sleep in the day. ?So far, things are looking very favorable for an on-timedocking,? shuttle flight director Kwatsi Alibaruho said earlier today. The astronautsdid spot a piece of a so-called ?flipper door? seal sticking up from the top ofEndeavour?s left wing and sent photos of it to Mission Control for analysis. The seal is used to control venting air from an avionicscavity inside the shuttle?s wing during launches and landing, said LeRoy Cain, NASA?s deputy shuttle program manager. It is one of manyalong each of the shuttle?s wings. The protruding piece is near the aft of thewing and not a safety concern to the orbiter or its crew, Cain said. The top of a shuttle?s wing does not see the hot,scorching temperatures experienced by its underbelly during re-entry, Cainsaid. The seal is also about 3 feet long, with only a small 4-inch strip peeledup at its leading edge, he added. ?From a mechanical and structural perspective, it?sreally not going to pose a problem for us,? Cain said. Endeavour blastedoff from NASA?s Kennedy Space Center in Florida before dawn on Monday inwhat is expected to be NASA?s last night launch of a shuttle ever. The shuttle?sSTS-130 mission is the first of five final shuttle missions before NASA retiresits three-orbiter fleet later this year. ?Yeah! Endeavour is on our way! ?space station astronaut Soichi Noguchi, representing Japan?s space agency,wrote on his Twitter page after watching Endeavour launch via a video link onMonday. Endeavour?s 13-daymission will deliver the can-shaped Tranquility module and the bay window-likeCupola dome. Both additions were built for NASA by the European Space Agency. Together,they cost nearly $409 million and require three spacewalks by astronauts toinstall. The new station additions represent NASA?s last bigadd-ons for the $100 billion space station, which has been under constructionsince 1998 by five different space agencies representing 16 countries. The spacestation will be 98 percent complete once they?re installed. But first, Zamka and his crew have to dock at the spacestation at 12:06 a.m.? EST (0530 GMT). Before the astronauts arrive, Zamka will park Endeavour about600 feet (182 meters) below the space station and then guide the 100-tonspacecraft through an orbital backflip. During the maneuver, astronauts inside the space stationwill snap high-resolution photographs of Endeavour?s tile-covered belly. Theimages will be beamed to Earth later so experts can use them to check thehealth of Endeavour?s heat shield. Shuttle health has been a vital concern for NASA since2003, when heat shield damage to the left wing of the shuttle Columbia led tothe loss of that orbiter and its seven-astronaut crew. So far, video images of Endeavour?sheat shield recorded during launch have revealed no obvious damage, ?thoughcameras did spot several pieces of foam debris fly off the tank during liftoff. Cain said none of those pieces appear to have struck theshuttle, and some of them appear to have separated from the back side of thetank. On Tuesday, Endeavour astronauts completed the first oftwo planned inspections of their shuttle?s nose cap and wing edges using a100-foot (50-meter) inspection pole tipped with laser sensors. That data willbe analyzed along with images from today?s docking, Alibaruho said. All of Endeavour?s astronauts have said they are eagerlylooking forward to seeing thespace station outside their shuttle?s windows. But the view will be extraspecial for two of them. Endeavour pilot Terry Virts is making his firstspaceflight on the mission and is the crew?s only rookie. Before launch, hesaid the views out the window were likely going to be among his favorite. U.S. Navy Reserve Capt. Kathryn ?Kay? Hire is the onlyveteran spaceflyer on Endeavour?s crew who has yet to visit the space station.She is making her second spaceflight. Her first one, STS-90 in 1998, was a16-day science flight that used a Spacelab module in the payload bay ofColumbia. The space station, she said, is much, much larger. It hasabout the same living space inside as a Boeing 747 jumbo jet and an exterior structurethat is as long as a football field. The station can be easily seen by thenaked eye from Earth on clear nights. ?It?s just a tremendously exciting thing to be able tosee that, to be a part of that and know that we have that available for scienceto the international community,? Hire said. SPACE.com is providing complete coverage ofEndeavour's STS-130 mission to the International Space Station with ManagingEditor Tariq Malik and Staff Writer Clara Moskowitz based in New York. Click here for shuttle missionupdates and a link to NASA TV. Live docking coverage begins at 9:30 p.m. ET.